Dan Croker has two obsessions - Sudoku and frogs. So he just had to combine his loves and make the Famous Frog Sudoku books. 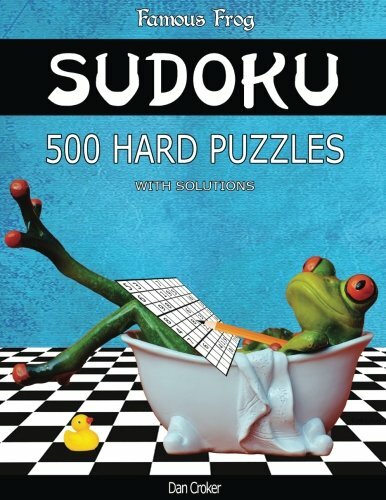 This Bathroom Sudoku Series 2 book contains 500 hard puzzles with 4 puzzles per page and a fun, quirky, colorful cover that is sure to brighten your day. Of course, you don’t have to be in the bath to do these puzzles! Solutions are given at the end of the book. More Famous Frog Sudoku series - Beach Bum Series, Bathroom Sudoku Series 1, Easy Series, Hard Series, Medium Series, Extra Hard Series, Brain Yoga, Sharper Pencil Series, Giant Series, Take a Break and The Travel Series.